When wisdom teeth pain is present, it is a sign of possible impaction or infection. When the tooth is impacted, it does not completely emerge from the gum. 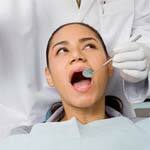 If not cared for properly, infection can settle around the wisdom tooth. This is partly due to collections of debris lodged in small openings of the gum surrounding the wisdom tooth. Wisdom teeth swelling will be a result of such an infection. Other signs of wisdom teeth pain besides swelling in the area are pain in the jaw bone, swollen lymph nodes, bad breath, unpleasant taste, pain when swallowing, crowding and movement of other teeth, and even cyst development. Although over the counter pain relievers and rinsing the mouth with warm salt water may ease wisdom teeth pain and swelling, further, more drastic measures are most often taken to permanently rid the pain and swelling from wisdom teeth, and that is wisdom teeth extraction. This is usually done by one of oral surgery procedures with some minor recuperation time involved. The first 24 hours after surgery are the most critical with some possible bleeding and facial swelling. Besides a liquid diet for at least the first day, the patient will receive antibiotics to prevent infection and acetaminophen for pain. Within a week or so of surgery, comfort level should be much improved.